T-AGM-25 will be handed over to the US Air Force in 2014. Image courtesy of Caterpillar Marine Power Systems. The ship was delivered to the US Navy in January 2012. Image courtesy of Military Sealift Command. T-AGM-25 is powered by four MaK 12 M 32 C diesel electric propulsion (DEP) engines. Image courtesy of Caterpillar Marine Power Systems. 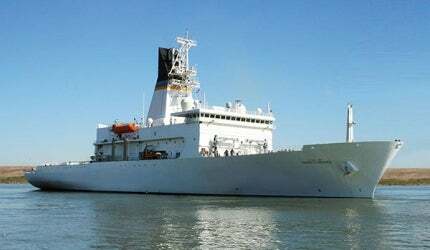 The USNS Howard O. Lorenzen (T-AGM-25) is the latest vessel of the Military Sealift Command’s (MSC) three-missile-range instrumentation ships. The new ship is expected to achieve initial operational capability in 2014. The other two missile range instrumentation ships are the USNS Invincible and the USNS Observation Island. "The vessel completed final sea tests in San Diego in December 2013 and will be handed over to the US Air Force in 2014." The contract for the design and construction of the T-AGM-25 was awarded to VT Halter Marine in September 2006. The ship’s keel was laid in June 2008, and the ship was christened in June 2010. The vessel was named after Howard O. Lorenzen, who is considered the father of electronic warfare. He was an electrical engineer in the Naval Research Laboratory. The T-AGM-25 was delivered to the US Navy in January 2012. The management services for the design and construction of the ship were provided by POE Ships. The investment on the vessel was $1.7bn. The vessel completed final sea tests in San Diego in December 2013 and will be handed over to the US Air Force in 2014 for operations and maintenance. The vessel will replace the existing USNS Observation Island. It has a lifespan of 30 years. The T-AGM-25 is a commercially designed and built ship. It has a length of 534ft, beam of 89ft and draft of 22ft. The displacement of the ship is 12,229t. The vessel will have 88 staff, including sailors, civil service mariners and mission technicians from government agencies. The ship will be used for tracking and monitoring all missile launches and weapon tests carried out around the world. It will also be used in data collection of the tested weapons and launched missiles, providing useful information to the designers of arms in the US. The Mobile Landing Platform (MLP) is a new class of auxiliary vessels under construction for the US Navy. It will be one of the 24 ships operated by MSC under its Special Mission Programme. Under this programme, ships are manned and operated on a contract basis by civilian mariners under the jurisdiction of MSC. The programme initiates various special missions for the US military and government. T-AGM-25 will primarily provide the platform for the Cobra Judy Replacement (CJR) Programme which will undertake radar data collection of ballistic missiles and strengthen weapons test programmes initiated by the US military. The CJR Programme is intended to substitute the capabilities of the current USNS Observation Island and the Cobra Judy radar system featured in it. The USNS Howard O. Lorenzen features a dual band Cobra Judy Replacement radar system integrating the X- and S-band antennas, a common radar suit controller, and other ancillary equipments. The X and S-band active arrays weigh 500,000lbs each. They will be capable of providing high-quality, high-resolution and multi-wavelength radar intelligence data. "The vessel will have 88 staff, including sailors, civil service mariners and mission technicians from government agencies." The X-band radar will be used for collecting data from several objects from different targets while the S-band radar will be used for collecting data from specific objects of importance. In December 2003, a $1.4bn contract to develop the CJR system was awarded to Raytheon. Northrop Grumman Electronic Systems, General Dynamics SATCOM Technologies, and Kiewit Offshore Services (KOS) are also involved in the project. The X and S-band antennas were installed by October 2011 and are currently undergoing integrated testing. Raytheon provided the X-band radar and the common radar suit controller, while the S-band radar was provided by Northrop Grumman. T-AGM-25 is powered by four MaK 12 M 32 C diesel electric propulsion (DEP) engines supplied by Caterpillar Marine Systems. Each engine has a rated capacity of 5.5MW and weigh of 84.8t. The propulsion system provides a speed of 20kt. The ship is also equipped with a Caterpillar C32 diesel generator, which will be used in case of emergency.